Booker T. Washington School in Marble Hill. 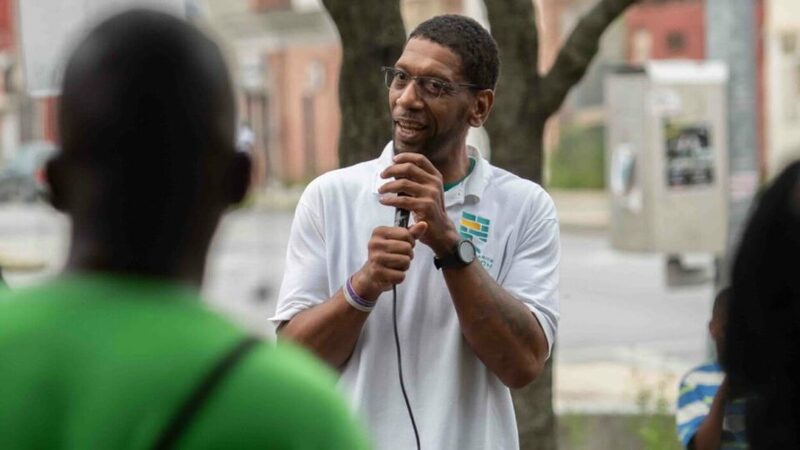 Under the direction of new president Atiba Nkurmah, the Marble Hill Community Association’s goals are to increase homeownership, attract investment, stabilize historic structures, decrease criminal activity and student truancy, and generally support neighborhood residents. Several public middle and high schools are located in Marble Hill, which lies just west of Bolton Hill, on the west side of Eutaw Place. Decreasing student truancy will no doubt have a positive effect on decreasing adolescent crimes in both Marble Hill and Bolton Hill. The Marble HIll Historic District was once the home of the African American elite of Baltimore. Unlike large areas of Bolton Hill that were demolished, Marble Hill survived the urban renewal of the1970s largely intact. Many beautiful buildings remain, including schools, churches, and continuous rows of grand houses. 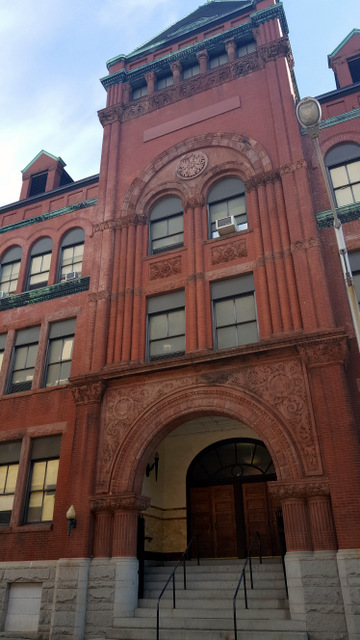 One of Marble Hill’s architectural gems, the impressive Richardson Romanesque-style Booker T. Washington School, on the National Register of Historic Places, just received 200 new, custom-made Marvin windows. Come by and take a look at this enormous brick and marble structure and its beautiful new windows! To name just a few of the neighborhood’s illustrious residents, prominent figures in the Civil Rights Movement such as Thurgood Marshall and Clarence and Juanita Jackson Mitchell, John Murphy (founder of the Afro-American newspaper), Harry S. Cummings (first African American Baltimore City Councilman and one of the first two African Americans to graduate from the University of Maryland Law School), Henry Hall (founder of the National Aquarium in Baltimore) Cab Calloway, and Billie Holiday all resided in Marble Hill. Built in 1857, Douglas Memorial Community Church is one of Marble Hill’s many architectural gems. Unfortunately, disinvestment in recent decades has caused many of the buildings to fall into a state of vacancy and disrepair. Marble Hill is working closely with the City of Baltimore and Baltimore Heritage to identify historic rowhouses to save them from demolition and to stabilize them where necessary. The properties are then put into the hands of responsible owners who will restore them to their former glory. This enormous task requires close coordination between the city legal department, code enforcement, financing departments, tax lien departments and stabilization crews. Marble Hill Community Association has appointed a new Architectural Review Committee (ARC) chairperson who will oversee these preservation efforts. After many years of service, the former ARC Chair Marion Blackwell has stepped down, and Marti Pitrelli will serve as the new chair of the ARC. The ARC will continue working to expand the current Marble Hill Historic District to include all streets of Marble Hill, an effort projected to take 1-2 years. 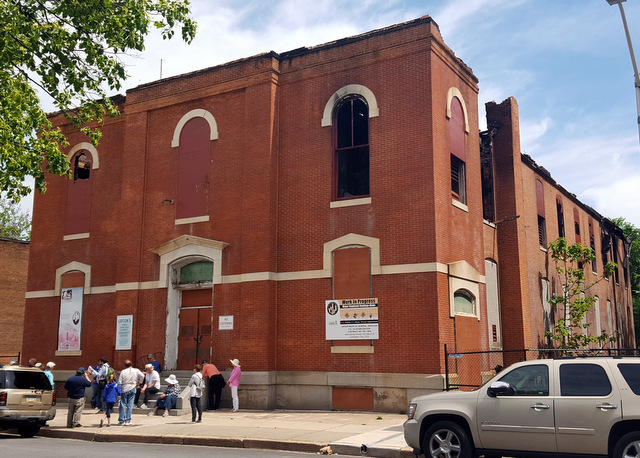 This new provision was used to protect the building from demolition, following the widely publicized demise of its “sister house,” the Lillie Carroll Jackson Freedom House at 1234 Druid Hill Avenue. The Freedom House was demolished against Lillie Carroll Jackson’s wishes, without community input or CHAP review, in October 2015. 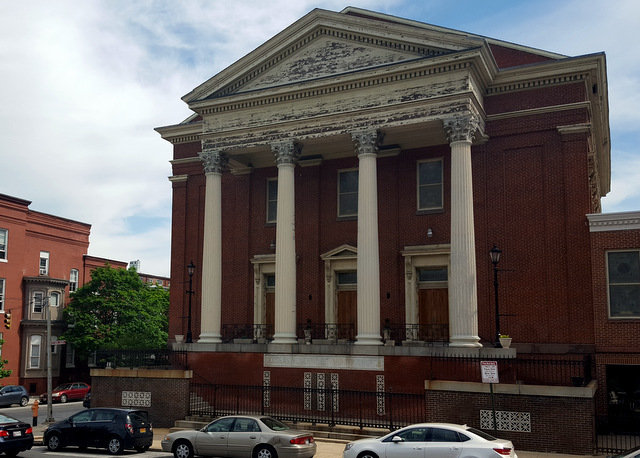 A series of hearings this year resulted in CHAP’s unanimous support of preservation of 1232 Druid Hill Avenue, and they ordered owners to stabilize the crumbling structure. Our District 11 Councilman, Eric Costello, will ask the Baltimore City Council to finalize the landmarking on December 8 at City Hall. Thurgood Marshall School was damaged by fire this summer. The National Park Service has plans to resurrect the Thurgood Marshall School (PS 103) on Division Street, after it suffered a devastating fire earlier this year. And the grand and historic Home of the Friendless, at 1313 Druid Hill Avenue, has been sold by the City to a developer who plans to create artist housing and studios. This building was also used as Baltimore City’s first African American Public Health Center in more recent times. It is on the National Register of Historic Places, and we are very grateful to the City for selling it to a local developer for adaptive reuse as The House of ART. Landscaping has transformed the newly restored Henry Highland Garnet Park at Druid Hill and W. Lafayette. The beautiful design includes planting beds, winding pathways and new park benches, and three large 20th-century iron urns which have been returned to the park. Since its renovation, the park has become a favorite gathering place for community events. Over 200 new trees and tree wells have been planted in Marble Hill and Madison Park with the help of Parks and People, the Baltimore Tree Trust, and many community volunteers. 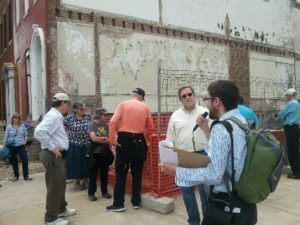 Baltimore Heritage tour group in front of demolished Freedom House. Marble Hill, as well as parts of Eutaw Place, are included in the National Park Service’s new Civil Rights Heritage District as well as the Pennsylvania Avenue Heritage Trail. 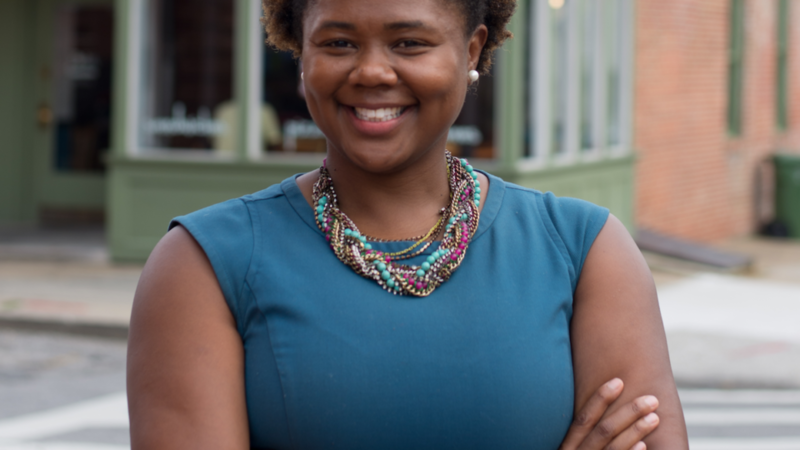 Sold-out historic tours of Marble Hill were conducted by Eli Pousson of Baltimore Heritage this year, and starting in spring 2017, Baltimore Heritage and Marti Pitrelli plan to continue tours of the neighborhood. Tour dates and other events will be announced in the Bulletin. Please walk over and see the progress being made in Marble Hill, and all the wonderful buildings and parks it contains. Witness for yourself the resurrection of Bolton Hill’s neighbor to the west.